A search-and-rescue team pulled a rare half-ton whale fossil from a Southern California backyard Friday, a feat that the team agreed to take on as a makeshift training mission. The 16- to 17-million-year-old fossil from a baleen whale is one of about 20 baleen fossils known to exist, Natural History Museum of Los Angeles County paleontologist Howell Thomas said. Baleen is a filter made of soft tissue that is used to sift out prey, like krill, from seawater. 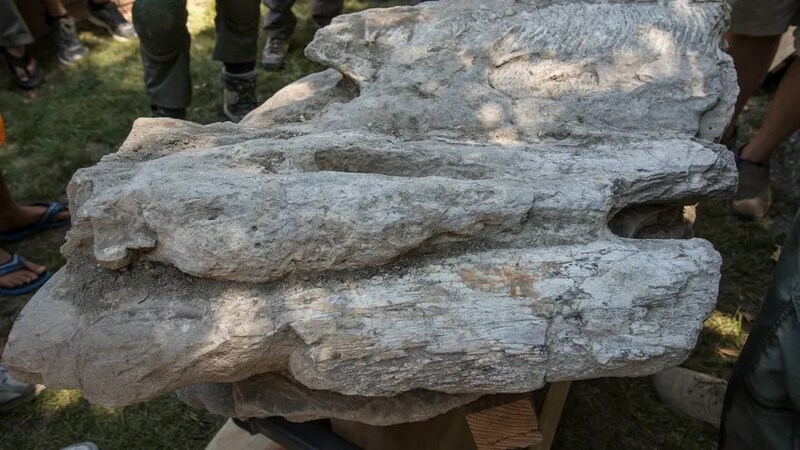 The fossil, lodged in a 1,000-pound boulder, was hoisted from a ravine by Los Angeles County Sheriff’s Department search-and-rescue volunteers. Using pulleys and a steel trolley, crews pulled the fossil up a steep backyard slope and into a truck bound for the museum. Gary Johnson, 53, first discovered the fossil when he was a teen exploring the creek behind his family’s home. At the time, he called another local museum to come inspect the find, but officials passed on adding it to their collection. In January, a 12-million-year-old sperm whale fossil was recovered at a nearby school, prompting Johnson to call the Natural History Museum. “I thought, maybe my whale is somehow associated,” said Johnson, who works as a cartoonist and art director. Thomas wanted to add the fossil to the county museum’s collection of baleen whale fossils, but was puzzled over how to get the half-ton boulder from Rancho Palos Verdes, located on a peninsula about 25 miles southwest of downtown Los Angeles. The sheriff’s department search-and-rescue unit declined to send a helicopter, but offered to use the fossil recovery as a training mission. The volunteer crew typically rescues stranded hikers and motorcyclists who careen off the freeway onto steep, rugged terrain, search-and-rescue reserve chief Mike Leum said. “We’ll always be able to say, `it’s not heavier than a fossil,”‘ Leum said.